The Port of Rotterdam experiences an increasing demand for offshore wind turbines, which therefore initiated the project Offshore Terminal Rotterdam (OTR) at Maasvlakte 2. Part of this project is the construction of a dedicated offshore terminal and a deep sea quay to manufacture and ship gigantic foundation piles (monopiles with a length up to 100m and a diameter of 10-11m) for wind turbines at sea. In 2016, Voorbij Funderingstechniek was contracted by Joint venture OTR Civiel (Mobilis, Dimco and Dredging International) to anchor the deep sea quay with 113 MV piles. 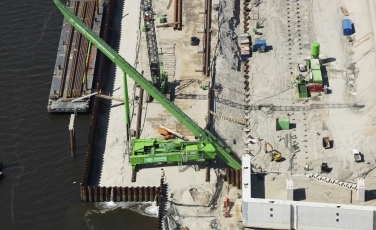 These piles were installed with a new MV piling rig, developed by Voorbij Funderingstechniek. This new rig drove the piles (H-profiles) into the soil at an angle of 45 degrees. The length of the piles ranged from 52 to 59 metres. The MV piles can withstand a tensile force of 9,100 kN. During installation, grout injection is used to make it easier to reach the required depth. MV piles are often used for anchoring heavy soil and water retaining structures, like deep sea quay constructions, because of their high tensile capacity. The quay in Rotterdam is exceptionally heavy, because it will endure high forces during the monopile loading by jack-up ships. Therefore, the MV piles for the Offshore Terminal Rotterdam have to bear a tensile force no less than 9,100 kN! The MV piles of Voorbij Funderingstechniek have the capacity to keep this quay stable. The deep-sea quay for Offshore Terminal Rotterdam has a length of 450 metres and a retaining height of 30 metres. H-profiles, type HEB600, equipped with HDPE grout pipes were used at the Maasvlakte. A specially developed test frame which Voorbij Funderingstechniek call ‘Hulk XL’, performed a load test on a part of the installed MV piles. The piles for the OTR quay needed to meet the test requirement of 910 tons. The piles were tested with 1.020 tons. The tested MV piles met the requirements. The start date was May 2016 and the finish date was September 2016. The quay will be finished in 2017.